He first describes him physically. Then he tells about reading an article which describes Holmes’ methods of observation and deduction. Who is this talking about? When and where is it happening? Perhaps most important—why? “As the weeks went by, my interest in him and my curiosity as to his aims in life, gradually deepened and increased. His very person and appearance were such as to strike the attention of the most casual observer. Watson was very curious about Holmes’ work, but he hesitated to ask about it. One morning he read an article that he thought was interesting but hard to believe. "’From a drop of water,’ said the writer, ‘a logician could infer the possibility of an Atlantic or a Niagara without having seen or heard of one or the other. So all life is a great chain, the nature of which is known whenever we are shown a single link of it. Like all other arts, the Science of Deduction and Analysis is one which can only be acquired by long and patient study nor is life long enough to allow any mortal to attain the highest possible perfection in it. By a man's finger nails, by his coat-sleeve, by his boot, by his trouser knees, by the callosities of his forefinger and thumb, by his expression, by his shirt cuffs -- by each of these things a man's calling is plainly revealed. That all united should fail to enlighten the competent enquirer in any case is almost inconceivable.’"
Watson commented to Holmes about how unlikely and impractical the article seemed. Holmes answered that he had written it. He then explained his work. He told Watson that what he wrote was actually very practical, as well as accurate. He explained that he worked as a “consulting detective” that other detectives would come to when they could not figure out a case. (from A Study in Scarlet by Sir Arthur Conan Doyle, 1887.) If you would like to read the whole story, you can check it out at almost any library (it’s a classic), buy it online or at a bookstore, or download the whole book online for free at www.manybooks.net. D) or social (working with other people)? A) It’s important to aim high, so you can attain your goals. B) It’s not possible to attain your goals. C) If you want to attain perfection in making deductions, you need to study a long time. D) Nobody can live long enough to become a perfect detective. 9. Conception is the process of a baby being formed inside the mother. We more often use the same term to talk about an idea (a concept) being formed, or of the artist’s ‘conception’ of his work-- the way he planned it and “sees” it taking shape. Abraham Lincoln even used it of a nation being formed. A) on November 11, 1918. B) on November 12, 1920. C) sometime in late 1918. Right-click here to download this crossword pdf to your computer. At the very beginning of The Adventures of Sherlock Holmes, Watson went back to visit Holmes. (Watson had moved away, married, and returned to medical practice.) Holmes immediately commented about Watson’s recent activities, and Watson asked how he knew. Watson said that Holmes made his process of deduction sound so easy that anyone should be able to think like Holmes, but he realized that he had not been able to understand how Holmes made his deductions until Holmes explained them, even though he had seen the same things Holmes did. When he asked why, Holmes answered, “You see, but you do not observe...” To Sherlock Holmes, careful observation was the necessary starting point for any investigation. How did Holmes know that Watson had been in the rain recently, and had a clumsy servant girl? A) He was superhuman and knew everything. B) Watson told him, then forgot. C) He deduced it from what he observed about Watson’s boots. D) He deduced it from Watson’s muddy pant legs. 2.Sherlock Holmes felt Watson had not been practicing one of a detective’s most important skills. Which skill was he weak in? 3.What is the best way to describe how Watson felt about Holmes? A) He watched him closely because he didn’t trust him. B) He thought he was lying because what he said was impossible. C) He admired him and was impressed by his skill at solving crimes. D) He wanted to be just like him. Even without this section on Sherlock, the first Back Issue (at the very bottom) has some useful links and detective vocabulary practice. 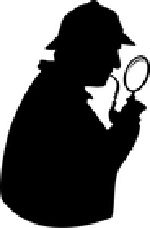 You might also be interested in the Word Detectives practice page, another author of detective fiction: Tony Hillerman, or a pdf quiz on Detective Vocabulary. 2.C) mental (using the mind). Detective work does involve all these aspects: sensory, physical, mental, and social, but analysis and deduction are mental processes. 10. A) on November 11, 1918. 1. C) He deduced it from what he observed about Watson’s boots. 3. C) He admired him and was impressed by his skill at solving crimes.